While I was setting up and experimenting for some laser photos earlier tonight, I was visited by a stranger and a police officer. I went out to the back roads on the outskirts of the city because there is some scenic, flat, undeveloped land out there with lots of distant stuff to point beams at. In the field, there is a dilapidated tower. That was my target. I set up on a dirt trail about 3/4 mile from the tower. I pointed the lasers at the tower on a line that runs parallel to the road. The road gets a bit of traffic at this time but not much. The idea was to go down to the tower and view the beam, measure it, and take some cool photos. I set up my 638nm ~200mW pointer and took my bike down to the tower to check it out. The view wasn't that great and I missed the mark a bit so the beam was just a tad over the tower. The backlighting from sunset made it difficult to aim. I noticed a truck park by where I set up the laser. 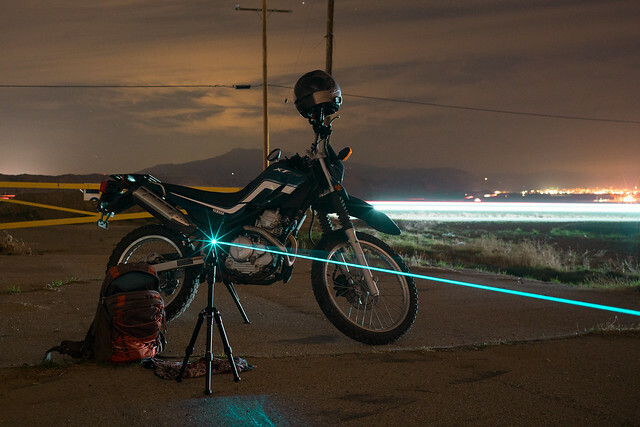 I rode back there and talked to a guy and his family who apparently saw the laser from the road and decided to check it out. This guy had a green laser he bought for emergencies while hunting. We chatted for a bit, I showed off my lasers, and he gave me his business card. Everyone thought the 495 was great. So I continued playing around and trying stuff out. Once it was dark enough, I set up the 495 the same way and as I was about to get back on the bike to head down to the tower, a cop drives up. Long story long: He received a call from someone about a laser and saw the beam from aaaaalll the way down at the end of the road. He asked me what I was doing, told me he gets quite a few calls about lasers and people pointing them at their aircraft, and informed me that it's a felony to do so. I was upfront about everything and assured him that I was keeping the beams on the ground (I was trying to, anyway). He asked for my ID and phone number in case he got another call - no big deal. I showed off my lasers again and he told me he doesn't care as long as I'm not causing trouble (I was far outside the city). This is the first time I've drawn any attention with my lasers but the encounters were both pleasant. The moral of the story is: 1) everyone likes the 495nm wavelength, 2) these lasers, though only modestly powerful, are quite visible from the right angle for quite a distance, and 3) being honest with the police worked out well for me. I ended up changing locations since I didn't like the photos I was getting. Aiming at some nearby mountains, the point is apparent at 1.5 miles. My 638 and my bike. This laser is one of my favorites of all time. It's really well "balanced" among its qualities. 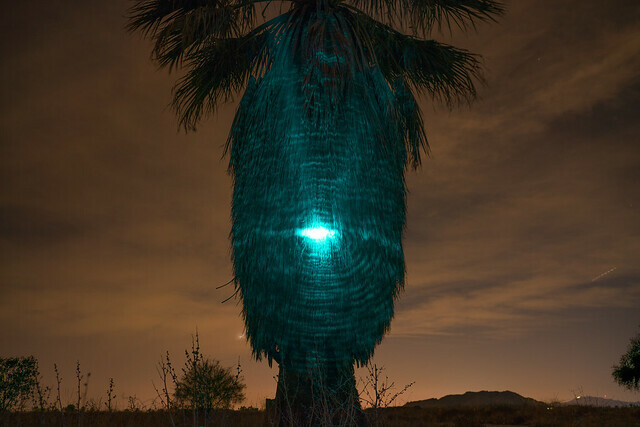 The 495 set up and projected onto a palm tree 0.2 miles down an abandoned road. 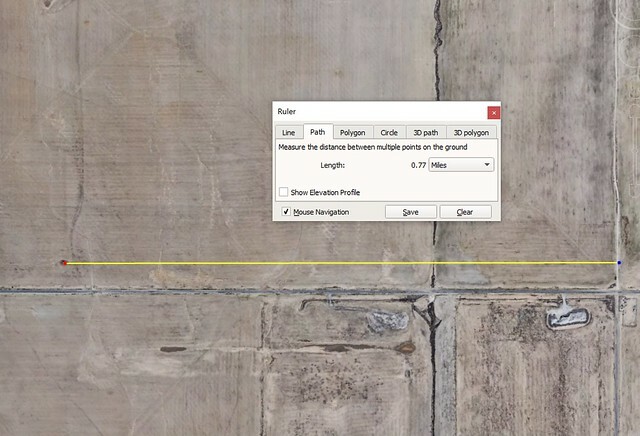 At this distance the beam is about .3 X .1 meters (1' X 4") across with a G lens. It got cold so I didn't take the time to measure divergence at this distance. The diffraction patterns are clearly visible and the jitter caused by the moving air makes a really cool visual effect. I'll have to capture some video of that later. I can't wait to put together my next laser and show it off (probably next week). For those that are interested, I'm shooting with a Sony a7R II and Zeiss Loxia 2/35 - a superb combination. I have heard other stories where if a policeman sees the beam, the always want to come and see what's up. There was one young member here who pointed his beam at a stop sign some years ago and a police lady arrested him for harassing her with it, due to how strong the reflection was off of the sign. You were clearly just wanting to take measurements and photo's, I am glad this cop was reasonable and didn't try to be heavy handed. Beautiful color, I agree, love it. That are really nice photos. And a great propagation of our hobby. Noone was harrased by your activities and you contributed to positive perception of portables. This is exactly what we need. Our lasers are powerful and of course visible. No need to attract attention, but limiting us to be hidden in cellar is also not the purpose. If the laser in operation is not hitting some objects like traffic signs (seriously this should not be done - they are designed to reflect light) or crossing roads etc., than there is responsibility and noone can blame you for being responsible. You definitely acted the best way you could. Rep+. Edit: During laserpainting I use warning signs (requesting to let me know) around the area under exposure, just in case someone walks around and wants to pass it. Anyway noone appeared so far in dark night forest. Very informative and interesting post. Glad things worked out well for you. I’ve had only one bad encounter with a stranger when I was shooting pictures in a rest area. She call the police but they never came. So all ended well. But still it was a little unnerving. I’ve always wanted to see just how away you could see a multi-watt laser. So thanks for the info. It something I’d like to experiment with in the future. Those pictures are really sharp and crisp. Very impressive beam shots. 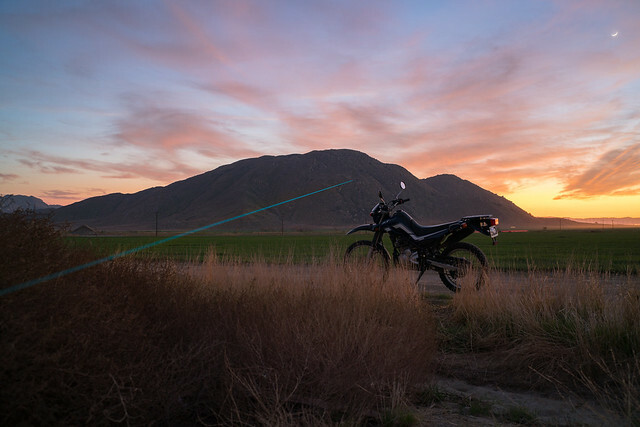 Like your bike in the shots, makes it that much interesting, puts things in prospective. Well done and thanks for posting. That make one good looking palm tree. Beautiful photographs! I like the one with the red laser and your motorcycle the best . I like how that color blends in with the surroundings. Radim - I CHOOSE to photograph in my cellar! If I really wanted to I could photograph anywhere I want. I do not what what country you live in, but where I live, near NYC, if people see anything suspicious they will call the police, and lasers fit into that category. We have four major airports within 50 miles of me. There are reports on the news , almost weekly, of people, lasers and airplanes. 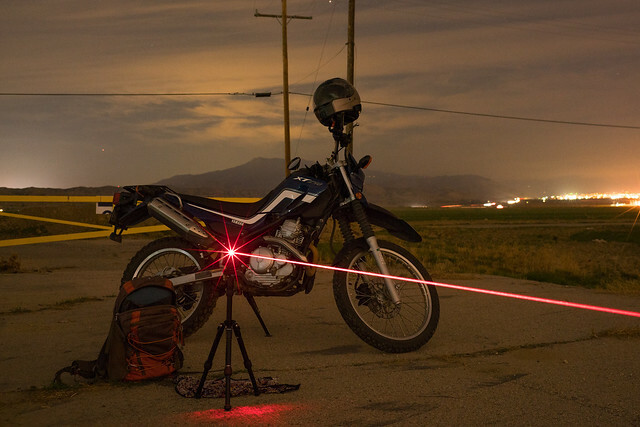 The police and Feds will reward people for turning in people who shoot lasers at airplanes. If I were to go out in woods near me and hang up signs, the first person who saw anything and report it and call the police, so would I. And the lasers would most certainly be confiscated. And for me in the cellar IS my purpose. Much more interesting than ubiquitous photos in doors or backyards. Do this again when the weather gets warm. No worries, Bruce. It is as legit as lasering anywhere. Just if safety is kept and disturbance of the others is prevented. I have projects in my mind involving even public areas of historical heritage sites to be laserpainted. These projects involve active contact with local authorities and permission. Precision and safe (with laser illumination intensity measurments) exposure based on calculation designed composition. Including laser safety zones definitions and those tested. Several attempts and final exposure made safe for potential public event, since lasers are not common as videomapping for example. And the project in progress will experience public attention soon. It must be art performance in motion in my case. But even this managable by one-two people IMO. And Bruce, thanks for your inspiring art here. I've learnt a lot from your artworks and followup discussions. It is also thanks to you the laserpainting thread is stickied and enjoyed here as we see. BTW What about your single art thread? Whew! After reading the title, I was sure this wasn't going to have a happy ending. Very glad to see that your interaction with the police was positive; this is the type of positive results that we don't see often, or hear enough about. Those are some outstanding photos, RA, it's nice to see some great beams in something other than total darkness, it adds another dimension that we don't normally get to see. Red is an interesting color for lasers. Even when it's quite bright, it can "disappear" easily. It's not as punchy in the sky as green or blue light. ... Like your bike in the shots, makes it that much interesting, puts things in prospective. Thanks! I originally didn't intend to keep the bike in the frame but I agree that it looks good. Some of my favorite machines are in these photos. Of course, I got a few of just the bike, as well. The sky was absolutely beautiful. There's no shortage of good sunsets in CA. Ouch... that's a bummer. Yeah, that's probably not a good idea but probably also an overreaction from the officer. I don't know where this happened but my impression is that it'll be less of an issue outside the city. ... it's nice to see some great beams in something other than total darkness, it adds another dimension that we don't normally get to see. My experience is in wildlife an landscape photography so I'm trying to find ways to integrate my landscape eye with lasers. It's quite difficult to make a picture of a straight line interesting. I'm glad you approve! Thanks. It is nice to get a positive response. Unfortunately I don't think that this incident improves the public nor the authorities' perception of lasers. There are apparently just too many incidents of recklessness. Fortunately for me, southern California has plenty of open space (despite the sprawling suburbs). The short drive is worth it. Very nice beam shots, Pierce. You just never know what's going to happen when you are approached by the police. Great that you wren't harassed. I do love the color of the 495nm diodes. Yeah, I didn't know what to expect. It's a bit of a bummer that someone would call the police when I'm all the way out there. The whole point was to avoid drawing attention! I don't think I've ever said thanks for finding and testing these, so, thanks! I'm glad to finally have this wavelength. Lovely photos! I bet you are glad that officer was nice to you otherwise you could of well been saying bye to that beautiful 495... It would have been quite an annoyance if that had happened .